Spacelab Architects is an Italian architectural design studio specializing in architecture, landscape design, urban development and with some productive experiences in industrial design. "Spacelab" was founded by Luca Silenzi (1972) and Zoe Chantall Monterubbiano (1973) architects in 2002 as an evolution of the former firm LS+ZChM architects, on the stage by 1993. From 2008, Spacelab is a partnership including in the original core Roberto Sargo (architect) and Giampiero Luzi (engineer). 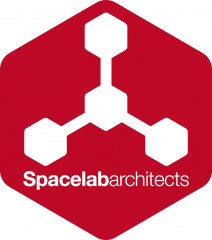 The name Spacelab is referring to the spatial essence of architecture and design discipline: the office is intended as an architectural and design research laboratory, guided by a continuous development and refinement of rough ideas into cutting-edge formal results and functional performances. Our flexible methodological approach incorporates parametric design and collaboration with specialists in other disciplines, combining programmatic requirements, construction and subsidiary studies into an integrated design. The 'human' dimension of the practice allows us to follow all projects with care and attention to detail typical of a tailoring atelier. Based in Fermo, middle Italy, the office has worked internationally since its inception and produced a wide range of work ranging from public buildings, infrastructure, offices, residential, products, to urban masterplans. Architecture from Spacelab pays a special attention to new building industry production methods, and with the contribution of new design techniques, to approach the complex nature of the architectural and urban project with smart working strategies: excellence and integration, with a not-banal approach to the context.